I have lived on the magical Island of Martha’s Vineyard for over 30 years. The Vineyard’s natural beauty has always been an inspiration for many. I believe it is a magnet that attracts artists of all varieties. It has an energy that is both stimulating and soothing. A contradiction at first thought, but it is that contradiction that I strive to create – funky, yet elegant, sophisticated, yet simple, original and yet timeless. In the past I have expressed my creativity in a multitude of ways — as a screenwriter, potter, and hand-colorist. But, my love for the art of jewelry design has had no equal. 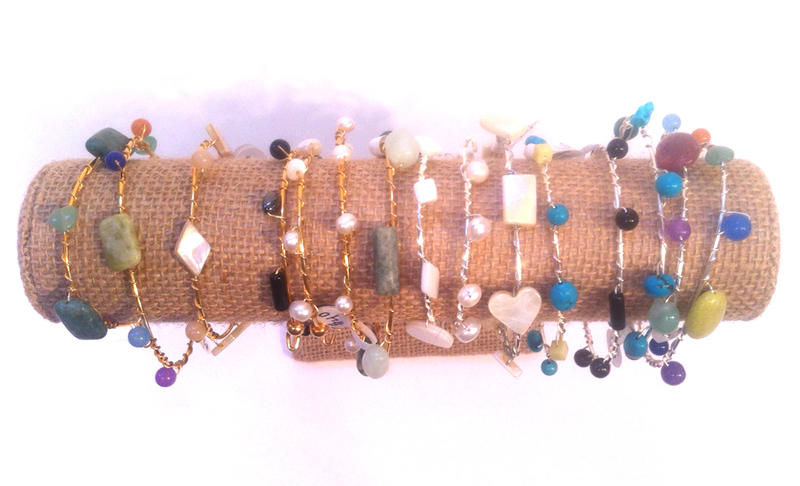 The semi-precious stones and freshwater pearls that I use in my jewelry are my palette. My designs are constantly evolving as I experiment with color and form and see new ways to achieve that balance. Thus, this website will be constantly evolving as well. It is thrilling to be passionate about something that people have responded to so enthusiastically. So, I thank you, my exuberant customers, for your support and encouragement. And, to any prospective new customer I very much look forward to working with you in the future.